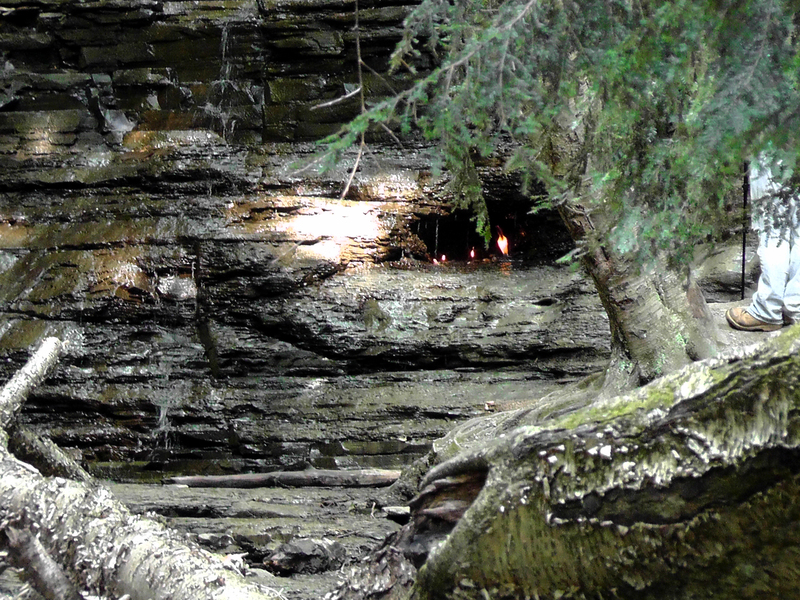 Eternal Flame Falls | Where's my backpack? Hidden in a sleepy little park in the northwestern corner of New York state is a rather unusual waterfall. 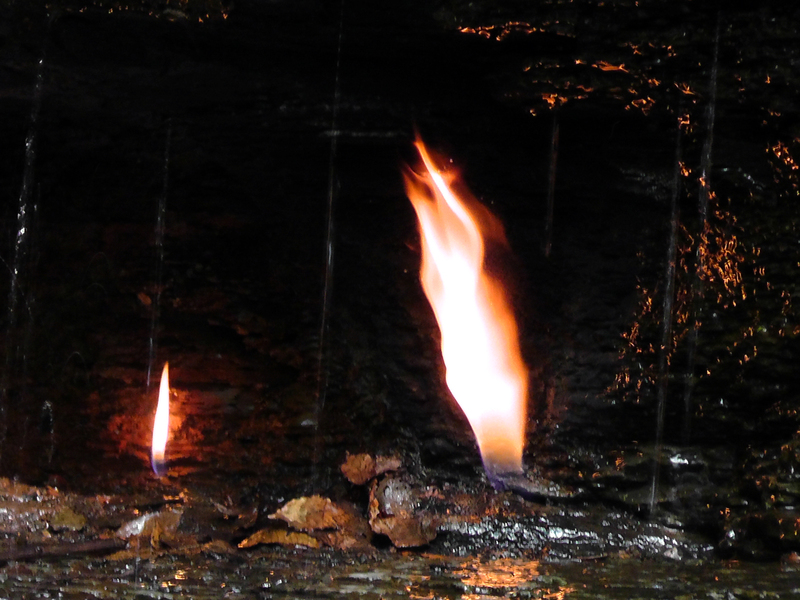 Eternal Flame Falls gets its name from natural gas emissions in a tiny grotto in the waterfall’s face which produce enough gas to sustain flames behind the falling water. 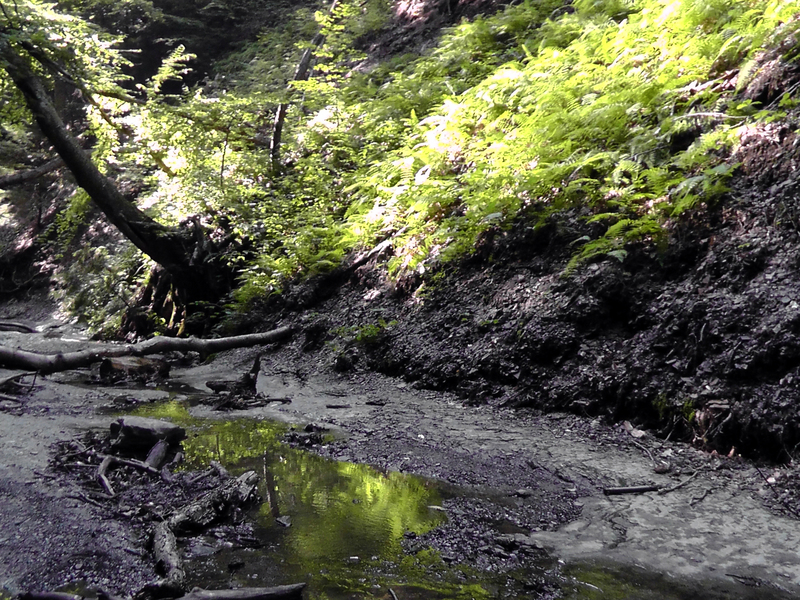 We pulled into Chestnut Ridge Park, just south of Buffalo, yesterday and started on a pleasant hike through dappled forest. 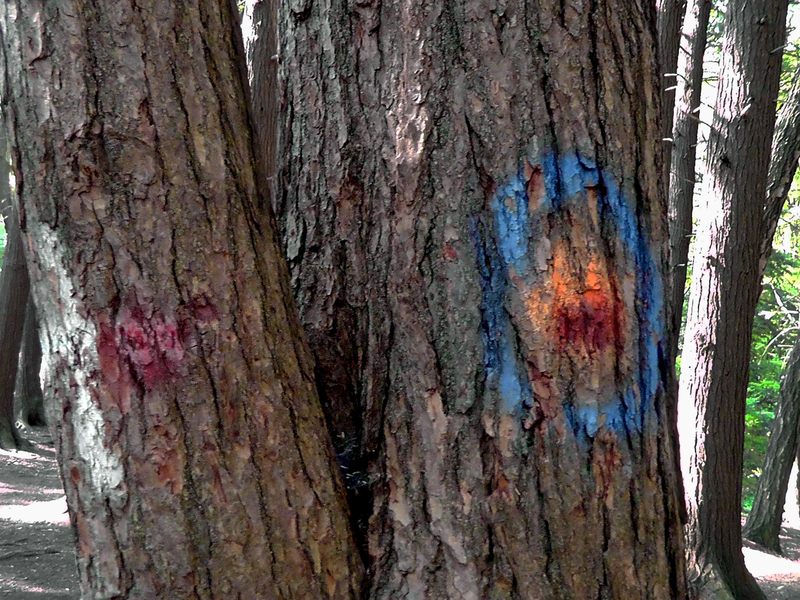 The way to the falls was signposted with rather mysterious-looking symbols painted on pine trees along the trail. The river has cut a deep gorge into the surrounding landscape, but there was little evidence of flowing water as I trekked along the river bed. 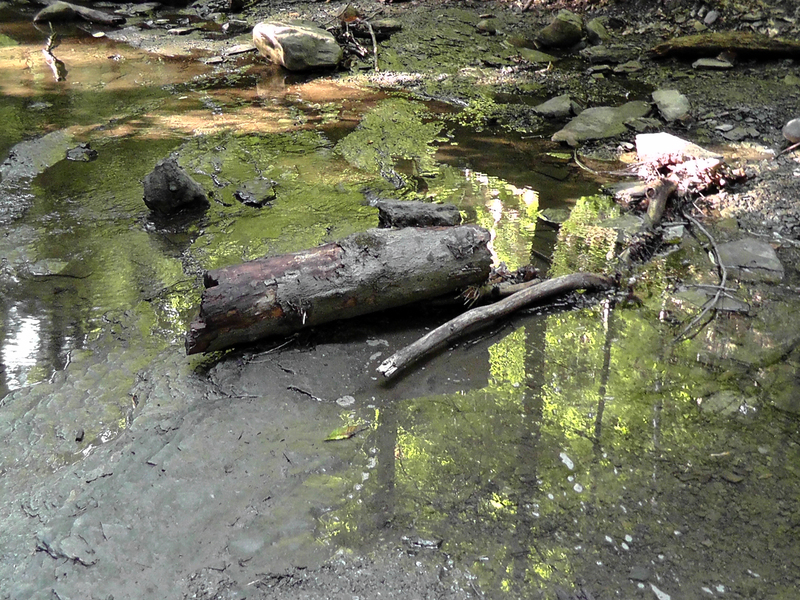 There was just a tiny stream of water trickling along in the heat of summer. 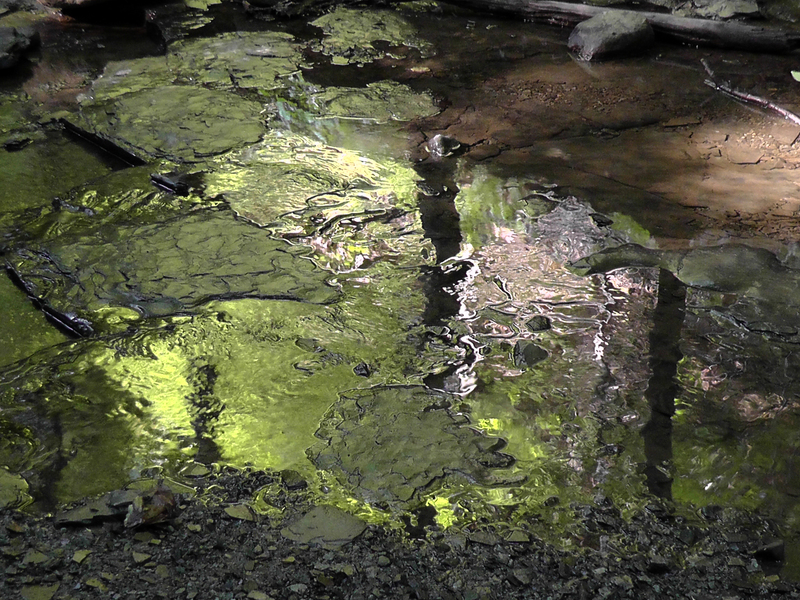 The water captured the reflections of the trees towering above us and cast an eerie green glow along the trail. I couldn’t resist taking a few shots – you know how much I like reflections. And then I saw flames, flickering away in the distance. On a good day, I had read, you might find two or three flames, sometimes a few inches in height – apparently this was a good day. 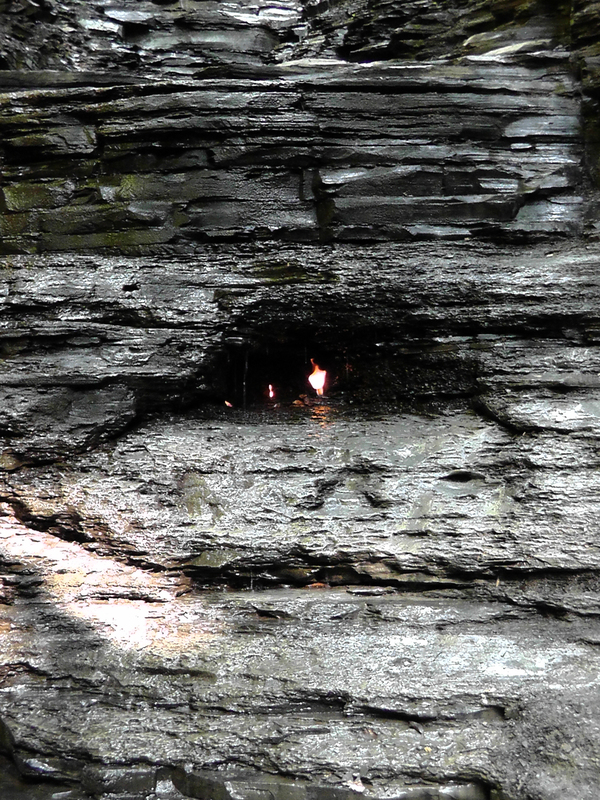 There were four flames in total, a large defiant orange flame surrounded by three smaller flames, glowing and dancing beautifully in the darkness of their little cave behind the waterfall. It was an absolutely wonderful treat at the end of a gorgeous trail, and if you’re ever in this part of the world, you should check it out. Huge thanks to my friend Susanne who told me about this little secret. This entry was posted in New York, Photography, Travel, United States and tagged nature, new york, photography, photos, pictures, postaday, travel, writing. Bookmark the permalink. Wow! So cool! Now I have YET ANOTHER place on my roadtrip list. 🙂 It’s OK. There are worse problems to have. A wonderful find and so unusual. Thanks for sharing. Glad you enjoyed it, Francine. It really was lovely. Wow! That’s awesome! I would definite add this on my list of places to visit. Thanks for sharing the journey and the photographs. I highly recommend a visit if you’re ever in the area, Gracie. It’s a fun, gentle hike with a great payoff. Fire and water together in nature is pretty wonderful to behold. A wondrous and miraculous find indeed. So untouched and raw and awe-inspiring indeed. Love the flames. Beautiful post. Thank you so much for sharing this with us. So, am I the only one whose brain is playing The Bangles’ “Eternal Flame” while reading this post? 🙂 Thanks for telling us about a very cool spot I knew nothing about! wow! what a fascinating end to an interesting trail. I would love to go here some day. I loved your third and fourth pictures..reminds me of your post on Manhattan reflections in puddles. Thanks for sharing. A wonderful post on a really different place. Thank you! Another cool adventure. The flames are just fascinating. Beautiful shots! Thanks Amy, it was a very cool experience, and it was so exciting to catch the first glimpse of the flames flickering in the distance. Wow!, fab shots Ailsa! Had never heard of this before! Seems like I will need to allot a LOT of time to your part of the world if and when I get there! Wonderful! the reflections are most unusual and the flames at the end – wow! It really was lovely, Gilly, hiking through the glen that was bathed in a shimmering green glow, and those flames were really beautiful, glistening behind the waterfall. Great post! Thanks for sharing this wonderful ‘secret’. Fascinating stuff! Love the reflection on the water, beautiful pics. Very beautiful! I loved the pictures! Such a neat find. And, as a photographer, I must compliment you especially on the fourth photo: green reflections. It’s stunning. Seriously..how do you find this stuff?? Spectacular!!! I love that about you!!! Keep them coming!! Awesome. And now I’ve got the Bangles song running through my head too. That’s a fascinating find and story. Thanks for sharing! What a brilliant find, a naturally occuring flame how amazing. really amazing. Only nature can come with such surprises of water-flames!!!!! What a cool find! Now I have a question for you. I get the whole gas emissions thing, but how is it lit? Did / does someone light it, is it spontaneous? Wow. The flames are truly amazing. Just can’t figure out why are there flames in the midst of a flowing water? Sorry (0_o)! But, nonetheless, it is really amazing! 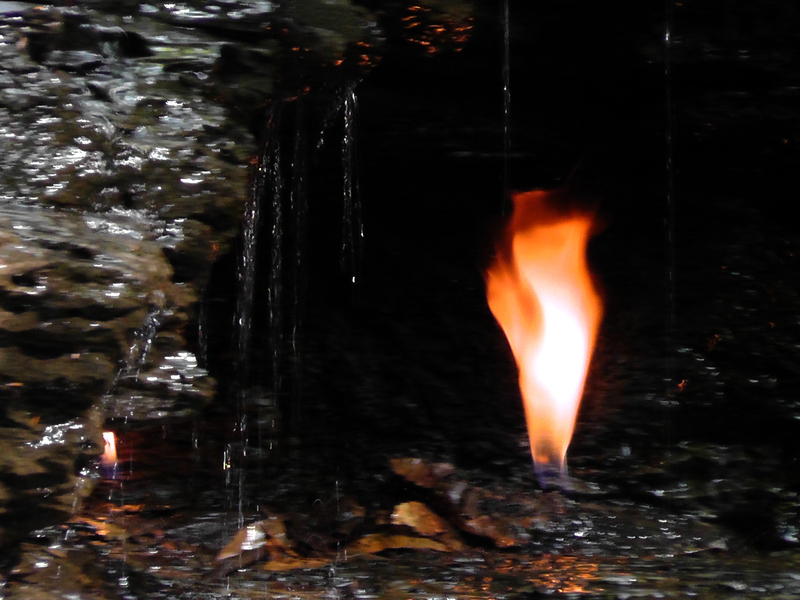 It’s a natural gas emission, GraCess_Mommy – and hikers passing by sometimes set it alight – it was already burning by the time we arrived – beautiful to behold! That is too cool, although the location is not a big surprise. Niagara Falls is near there as is Letchworth. The same geological upheavals made all of them. This is partway between Rochester and Buffalo, New York. Hey, great post, Nancy – Letchworth wasn’t on my radar, otherwise I’d have tried to visit, it looks amazing. Next time!